I see a lot of information on Branding but not a lot on re-branding and how to take your current blog and transform it to fit where you are right now. So I took the tips from branding and some friendly advice and my own ideas and this is how I re-branded myself. I have struggled so much with keeping my original blog or trashing it and starting from scratch. Re-Branding yourself if you are serious about what you want your online presence to be is so important and you don’t have to delete any existence of who you were but you can use what you had and start fresh. I have gone through a lot of name changes, theme changes, platform changes etc… but now I can say finally that I have clear vision of who I want to be known as. 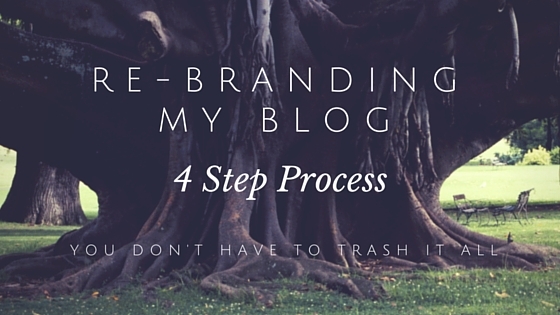 Here are the 4 steps that I took as an unknown blogger to re-brand myself. This is for someone that isn’t really established yet in the blogging community but has been blogging for a little while. It is so important to be consistent across all platforms if you really want people to recognize you and know who you are. By doing this it shows people that you know who you are. So since I wasn’t quite established I changed my twitter handle, Instagram, Pinterest and Facebook page names to be consistent. I had Blogger and Wordpress and I decided to transfer my old blogger blogs into one blog on Wordpress. Which is also where I had my Photography website and blog. Keeping them on one platform helps me to manage them so much easier. Setting them up and getting used to how to customize one platform saves your brain from information overload. I am not saying one is better than the other I just decided on Wordpress. This was hard for me. I loved all of my blog post but some of it just didn’t fit with who I wanted to relay that I am now. I first went through each post one by one (yes every post) and I gave them each a new category label based on my current brand, trashing post as I went. Yes… hitting that trash can icon was not EASY… but I did it. It only made sense that some things had to be let go. After I did that I did a second pass through and got rid of more post and narrowed my categories down to 3 main categories. I learned a lot about my writing style and the topics I am most passionate about. It is a great exercise to help you learn who you really are RIGHT NOW. 4. Start gathering ideas and content for your blog re-launch. The way I did this was through participating in FB groups and seeing what post appealed to me most where I couldn’t help but respond and offer up some (hopefully) helpful and encouraging advice. I also started taking note of my ideas and getting them down on paper. Before I relaunched I had some new content to go with the older content. You want to show new content and current date postings so your readers know you are serious and they can rely on you to be active. I hope this helped to give you a little jumpstart. There is a lot of great branding content and other great Info-preneurs out there that have many useful resources to help you figure out what your vision is. What your brand is and who your target audience is. Check out a few of these awesome ladies and make a commitment to really focus on your passion and purpose. If you Re-Branded yourself how did you do it? Are there any additional steps you would suggest? Let me know if this was helpful at all and I can go into more detail on any topic if you are interested.